Victory Motorcycles turns 18-years-old today – and says it is only just getting on the throttle as the brand celebrates a year of racing wins and the release of its newest motorcycle Octane. The first Victory model was the V92C, first shown in 1997 at Planet Hollywood in the Mall of America and was unveiled by the American race car driver and two-time Indianapolis 500 winner Al Unser, Jr. The theme of ‘American muscle’ that continues to this day started all the way back then. The V92C went on sale in 1998 and was phased out of the line-up in 2003. In 2011 a V92TC was frozen in a block of ice to go on display in the Ice Hotel in Sweden. After four years in the freezing ice, the V92TC was taken out and brought back to life with just a fresh tank of fuel and some minor fettling, pointing to Victory’s extraordinary reliability. 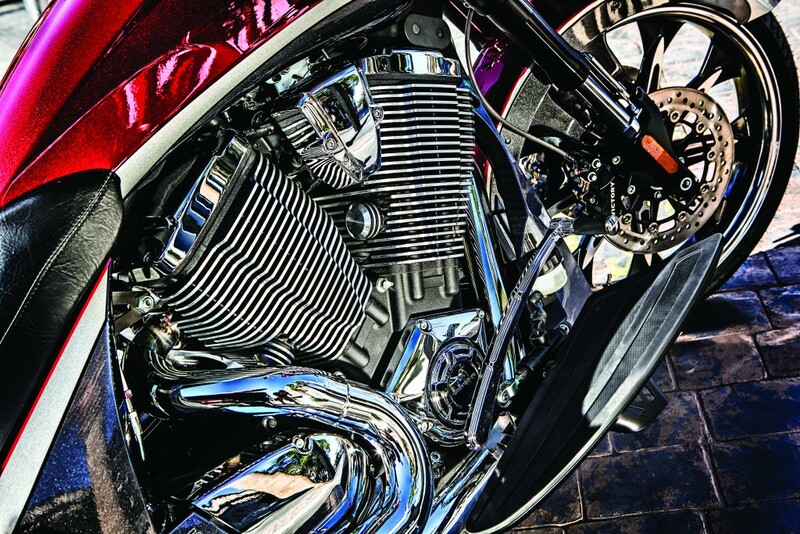 In 2002, Victory created the Freedom engine (100ci) – the forerunner of the Freedom 106ci engine that powers many of Victory’s models today. It had the same dimensions as the engine in the V92C but had a higher power output, rounded cylinders and smaller oil cooler. The Freedom engine was used in a new model called the V92TC Touring Cruiser that sold until 2006. A year after the Freedom 106 was announced came the first Victory model to have the look and visuals of the line-up we see today – the Vegas. This was designed by Victory designer Michael Song, who is still with the firm. 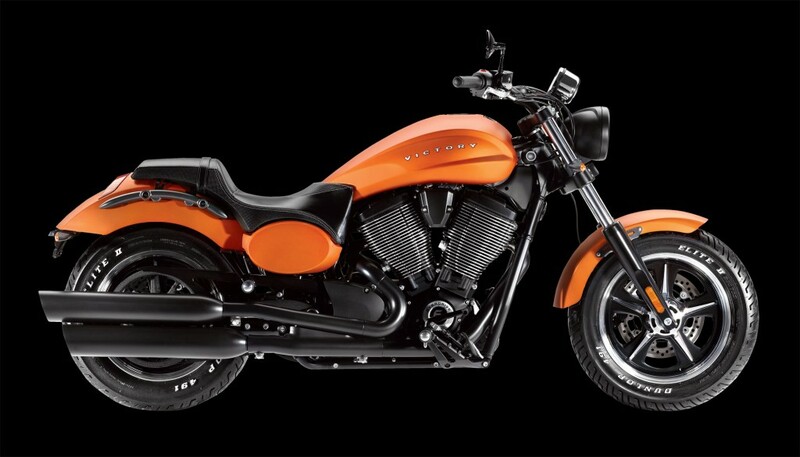 This also marked the start of Victory’s ‘custom cruiser’ line-up. 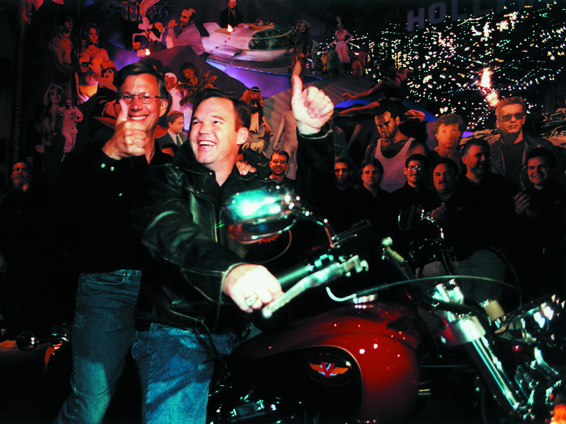 Victory turns 5-years-old in 2003 and the manufacturer forms a relationship with Arlen Ness and his son Cory Ness, a relationship that continues to this day. Together they create a limited-edition model based on the Vegas but with aftermarket parts manufactured by Ness such as billet aluminium accessories, custom paint schemes and their signatures painted on the side panels. 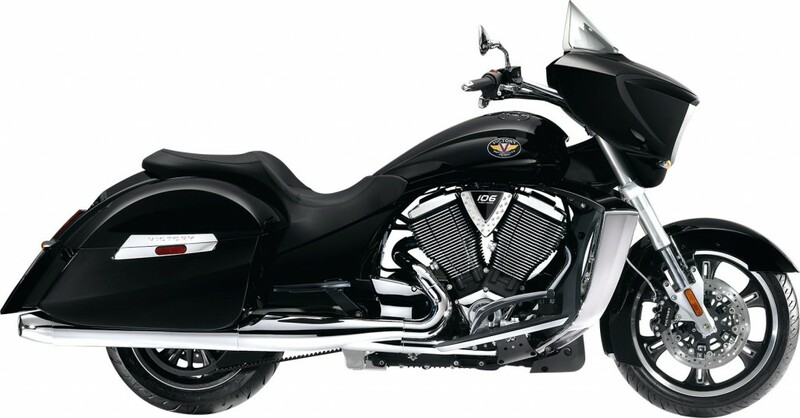 A year after the Vegas, in 2004 comes Victory’s second cruiser – called the Kingpin. A Kingpin Deluxe was launched as well, having some luxury items to attract riders looking for more comfort. A Kingpin Tour model was added to the line-up when the V92TC (Touring Cruiser) was phased out in 2006. By 2005, the Vegas and Kingpin have been selling well and Victory adds a third cruiser to the line-up called the Hammer. This goes on to be one of the best-selling cruisers and becomes a popular choice for owners to customise, particularly in Europe. A sportier Hammer S model is also released. 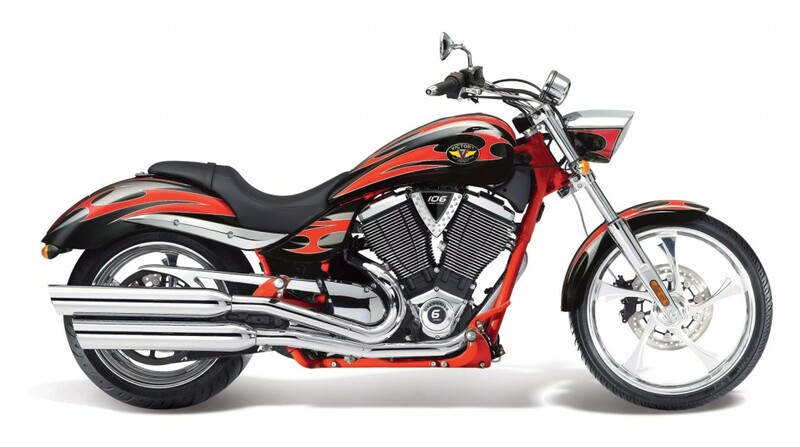 In 2006, Victory brings out the Vegas Jackpot, an “extreme version of the Vegas” with a 250 mm rear tyre, a colour-matched frame and bold paint schemes. It is designed to be Victory’s top-of-the-line cruiser. 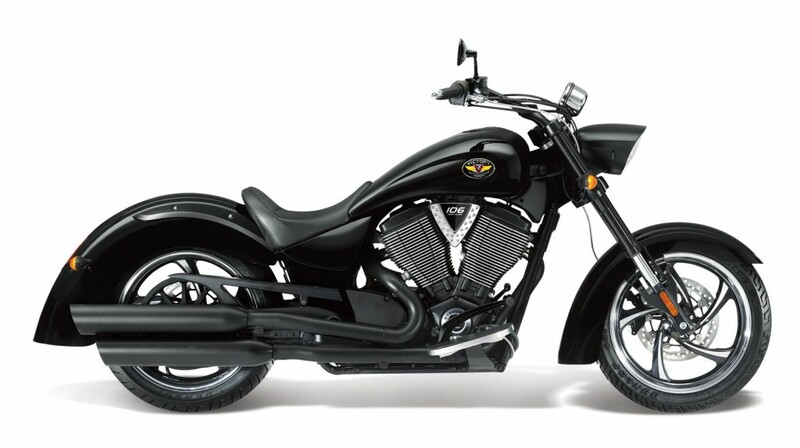 In 2010 Victory takes another step forward by releasing two hard-baggers – the Cross Country and the Cross Roads. 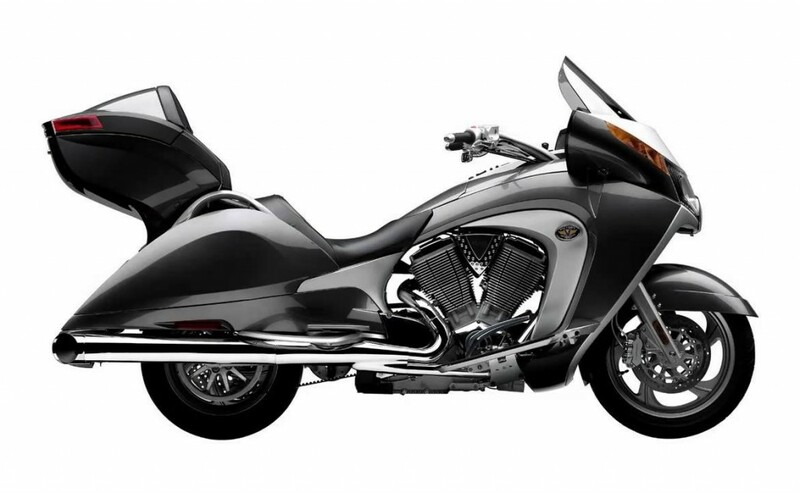 Both have a handlebar-mounted fairing, 21 gallons of cargo capacity, 4.7 inches of suspension travel, floorboards, cruise control and an MP3-compatible sound system. In 2016, the Swiss Endurance rider “Grizzly” starts a world record attempt at riding a Cross Country on an all-continents circumnavigation of the world and is due to arrive in Daytona, USA on July 10th 2016. 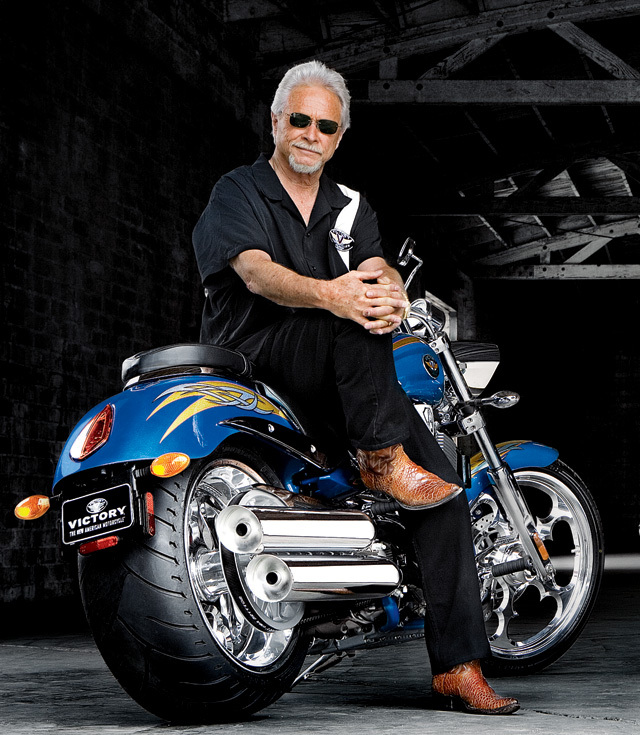 In 2010 Arlen Ness and Cory Ness created two more limited-edition Victory models; the Arlen Ness Vision and the Cory Ness Jackpot. Both models had custom paint and wheels, Ness chrome parts, diamond-cut engine heads and were numbered and signed. 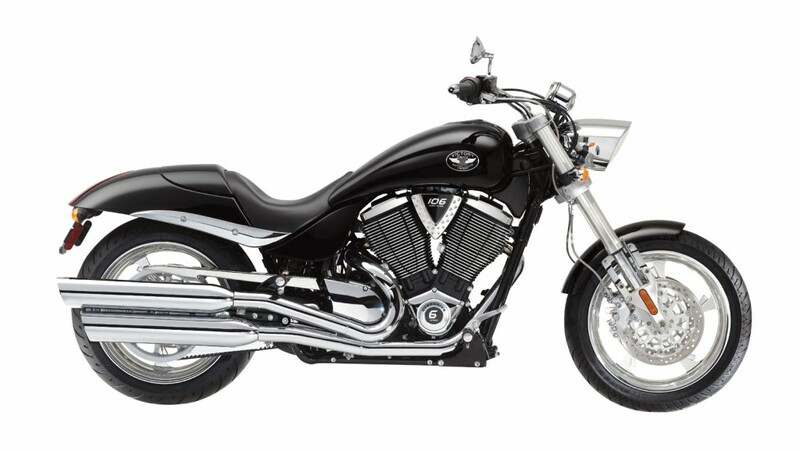 Noticing a demand for sportier looking cruiser, Victory brings out the Judge in 2012 with muscle car inspired styling and mid-mounted foot controls. 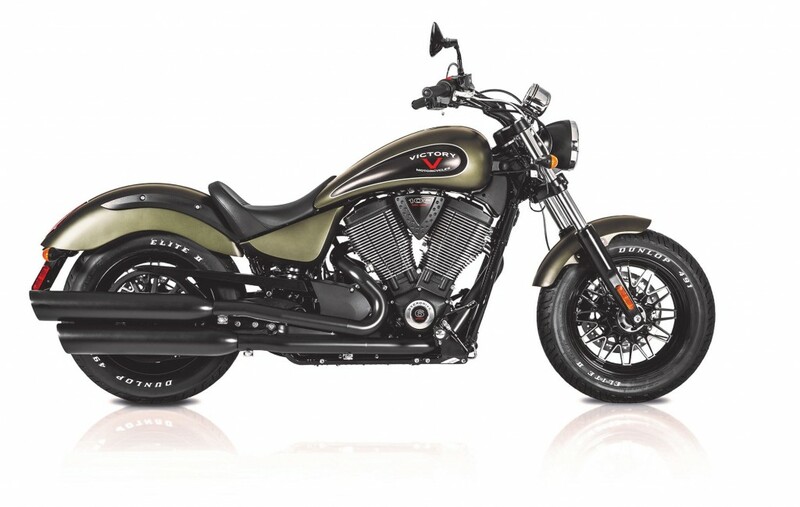 Also in 2012, comes the High-Ball model; Victory’s first foray into making a ‘bobber’ style motorcycle. The High-Ball comes with apehanger handlebars, wire wheels and a black & white paintwork with painted-on logos instead of badges.ted foot controls. Introduced in February of 2014, the Gunner becomes the most muscular cruiser in the line-up, again powered by the Freedom 106 engine. of badges.ted foot controls. Victory announces its intention to enter the Isle of Man TT with an electric motorcycle – Empulse RR. 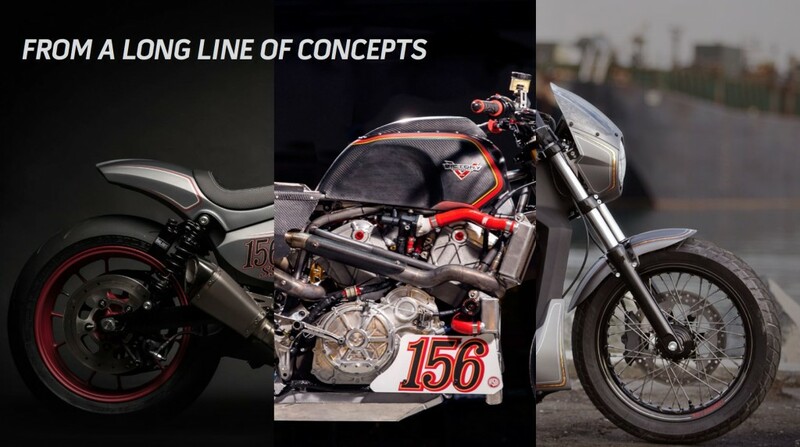 It also announces it will enter the Pikes Peak International Hill Climb with a bike called Project 156, developed with Roland Sands Design and using a prototype 1200cc liquid-cooled engine destined to appear in a future production motorcycle. 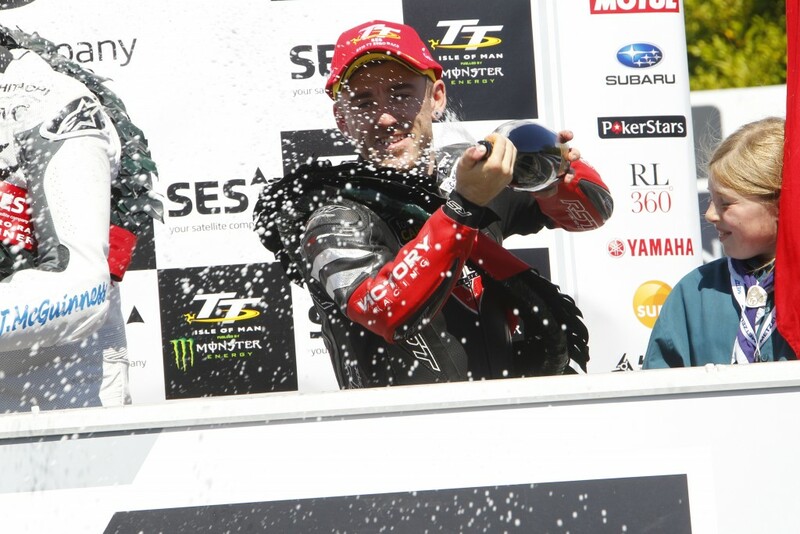 Victory placed third on the podium in the TT Zero race with rider Lee Johnston. Sadly Don Canet had a DNF at Pikes Peak after trouble with the fuelling on Project 156 at high altitude. During the same time, Victory also launched the Empulse TT in the United States – its first production electric motorcycle. In 2015 Consumer Reports in the USA announces that Victory Motorcycles owners are the “most satisfied” owners of any motorcycle. In analysing data from over 12,300 motorcycles across 10 brands, Victory led the pack with best overall owner satisfaction plus it got the top spot for comfort. 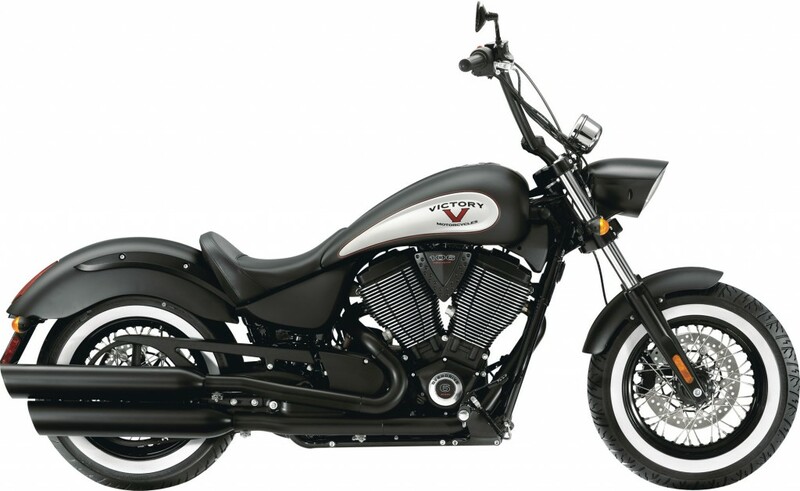 Victory not only excelled in owner satisfaction, but the company had a strong result for reliability. After Victory hinted that the engine in Project 156 might be used in a future model, the manufacturer enlisted the help of Zach Ness in the USA and Urs Erbacher in Europe to build two concept bikes using the new 1200cc production engine. Erbacher’s ‘Ignition’ concept was met with rapturous applause at its unveiling at the 2015 EICMA while Zach Ness deafened the audience with the exhaust noise of his ‘Combustion’ concept at the Union Garage in Brooklyn, New York. 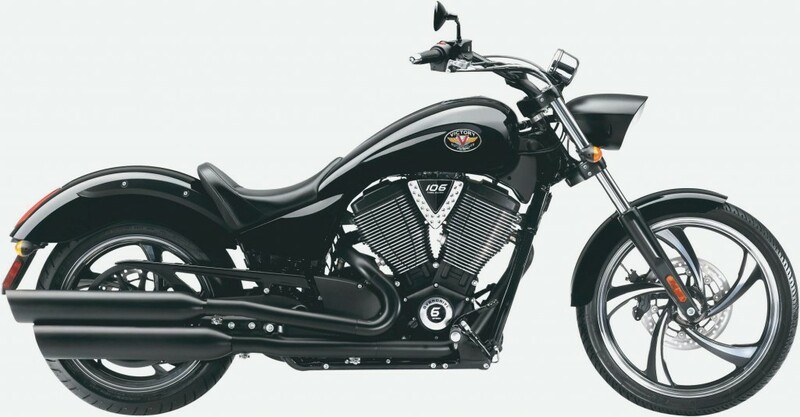 Victory’s newest musclebike – Octane – is finally revealed to the public in February 2016. 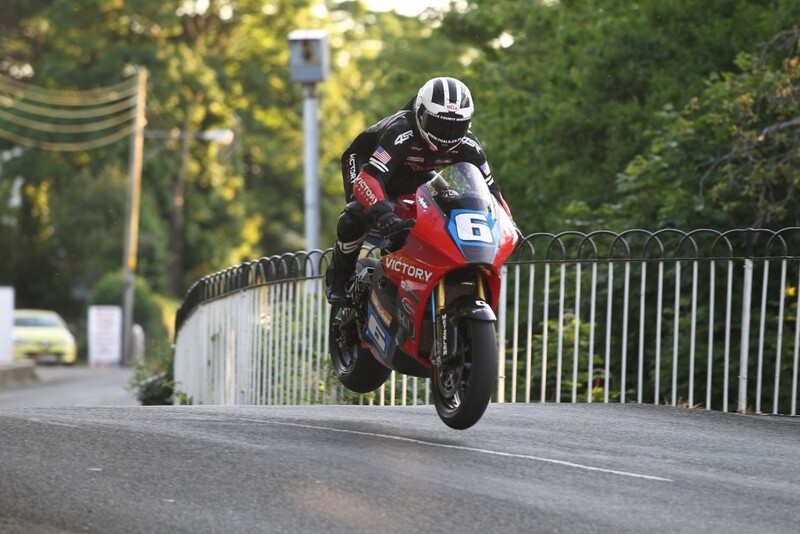 In June 2016, Victory Racing surprises the world with a brand new electric race bike called the Victory RR, which would be raced by William Dunlop back at the Isle of Man TT. William consecutively posts faster and faster lap times in the practice sessions and goes on to take 2nd place achieving an average lap speed of 115.844mph. 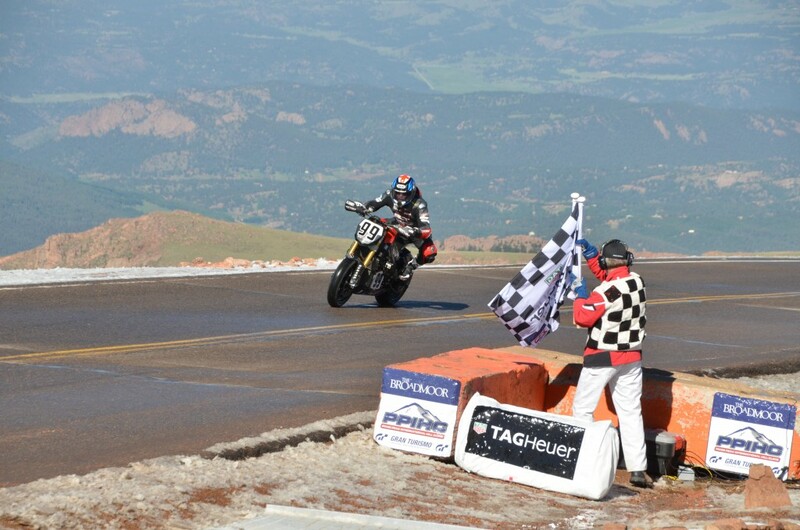 Victory returns to Pikes Peak, the 100th anniversary year of the race and posts the second and third fastest motorcycle times up the 12-mile long course to the summit. While Don Canet rode Project 156 the year before, this time he switched on to the electric Empulse RR (a re-worked version of last year’s Isle of Man TT bike). Meanwhile Victory found a new racer to ride Project 156, namely the former Pikes Peak Jeremy Toye. In a battle dubbed Thunder Vs Lightning between the two bikes, this time it was the Lightning (electric) that won with Don posting a time of 10:17.813 and Jeremy (thunder) posting a time of 10:19.777 – just two seconds slower.